Tips on how to maintain your hardwood floors. To most people, their home is life’s greatest possession and a large source of pride and joy. Which is why they devote so much time and energy to its upkeep. Beautiful, charming, inviting homes are the wonderful result. 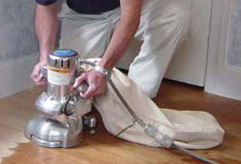 Floor coverings are a major part of a home. So read on and learn the many ways you can maintain your hardwood investment – your home investment and source of pride -- today and tomorrow. 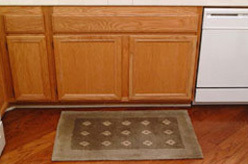 Be sure to avoid using rubber-backed or non-ventilated mats or rugs as they can damage your floor. Instead use mats or rugs made especially for hardwood floors and remember to shake them out regularly. This should only be done if a screening and recoating does not solve the problem. This is an extensive process where the floor is sanded down to the bare wood, re-stained and then refinished. If the damage is only in a small area you may want to see if replacement boards are available to alleviate having to refinish an entire area. Be sure to hire an experienced professional when having any work done on your hardwood floor. We suggest you contact us for advice. 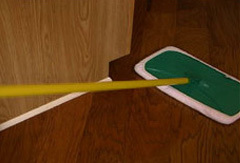 Protect your hardwood floor against tomorrow, sunshine and activity. Consistent upkeep and periodic professional maintenance will keep your hardwood flooring beautiful, inviting and durable for years to come. Depend on us to deliver complete, dedicated customer service during your shopping experience and outstanding, professional installation later. We hope that the information we’ve provided here leads you to a clearer understanding of how to maintain hardwood flooring.